Well we thought this would never happen again, we gave up on the idea about three years ago cos it was too much like hard work, but since the website went on line we have decided that we ought to do the magazine again. After all, you can't read a webzine on the bog unless you are in the habit of taking a laptop with you when you have a crap. So, after many nights of burning the candle at both ends PEPPERMINT IGUANA ISSUE FIVE is now ready to roll. Now not only can you read the Iguana at your computer, you can now read it in a tent, up a tree, on a protest, on a bus, in the bath and ..yes.. on the bog. 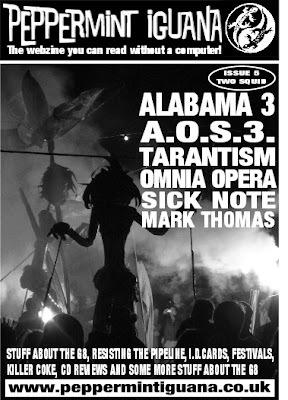 This issue contains interviews with Alabama Three, Sick Note, AOS3, Tarantism, Omnia Opera, Mark Thomas plus articles about the G8, ID cards and the LNG Pipeline protest and a shed full of CD reviews. We had been holding back for a ‘Diary Of The German G8’ article from our correspondent on the front line, just as we were giving up on it arriving and considering writing a slightly out of date Gleneagles diary, our comrade came up trumps and it has to be said it was well worth waiting for. This next week is going to be a bit chaotic now, somehow we have to get it copied, collated and stapled then get to Tony Bliars leaving do and the Workhouse festival.. so blogging is not quite back on the agenda, but normal service will be resumed shortly! Blogging is ever so temporarily suspendid as i am doing my best to get a zine ready for publication. However, there are two bits of important news for you..
and the tofu love frogs are back!!!!!!!!!!!!!!!!!!!!!! !